1. In a large bowl, whisk the eggs then add lukewarm milk. 2. Whisk in the salt, baking soda, and honey. 3. Gradually add the flour, whisking until smooth. 6. Heat a 10-inch non-stick skillet over medium heat (about 4½-5 on electric stove). Coat the pan with Earth’s Finest Coconut oil and ladle ¼ cup batter into the center of the pan, turning and tilting the pan in a circular motion until the bottom is evenly coated with batter. 7. Cook for about 1 minute or until the edges are golden and the top is no longer runny but still under cooked. 8. Run spatula around edge of crepe to loosen. 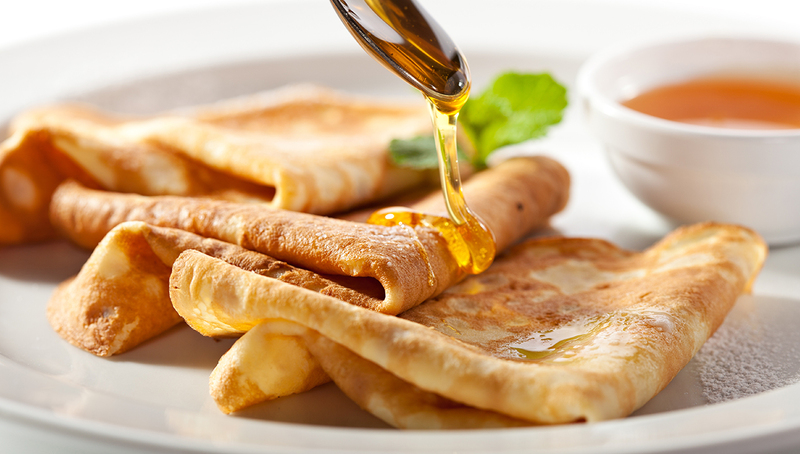 Slip spatula under crepe, and gently flip in one swift gesture. If it doesn’t land quite right, use bottom flat side of spatula to unfold and rearrange the crepe. 9. Cook for additional 1 minute or until bottom is lightly brown. Transfer to a plate. 10. Repeat with remaining batter, spraying the skillet with coconut oil every other crepe. *when working with coconut oil in liquid form it’s important to have all ingredients at room temperature as the coconut oil quickly returns to solid form when combined with cold ingredients. Even at room temperature, you may get little solid chunks of oil around the edges of your bowl and if that happens give it couple whisks to incorporate the chunks.